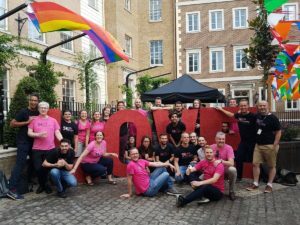 Our new Events Manager, Gareth, reflects that our core purpose has never changed, even though the times have been a-changing. 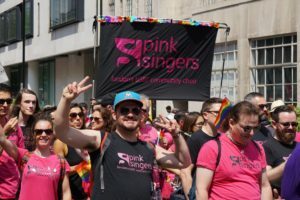 Having a birthday always brings a few things into perspective, so when the Pink Singers turned 35 (and I reached 36) this year it encouraged me to learn a bit more about where the choir has come from, where we are now and what the future holds. A quick rummage on the website brought me face-to-face with the immeasurably profound online archive Singing the Changes, compiled to celebrate the Pinkies’ last big milestone of 30 years. Taking time to read through this lovingly curated potted queer history set against my own milestones was a really moving experience and I thoroughly recommend you head over and learn, or remind yourself, of the tenacity displayed by groups like the Pink Singers to make it through a far bleaker situation for the LGBT+ community than that we currently face. 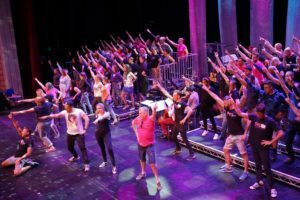 Joining a group with such a history can be an intimidating thought, but there are countless inspirational testimonies from past and present members as well as plenty of footage underlining the primary purpose of the choir: spreading joy through song. Moving on to the present and my first year with the Pinkies, I find that primary aim still very much in place. Joining the choir for my first performance at the Cadogan Hall, I was struck by how much joy this odd-ball bunch of 90 people from across the gender spectrum is capable of exuding in each and every number from .Nuxx’s Born Slippy to Irene Cara’s Flashdance and even Fauré’s sumptuous In paradisum. The reactions I’ve had from friends, family and loyal Pinkie fans, showed me that, even after thirty years of singing in choirs, there’s still a huge amount for me to learn about putting on a good show. From a celebration of the best of cinematic music to our own 35th celebratory mixtape, my time with the Pinkies keeps throwing out glorious moments and learning challenges The choreography to Livin’ Joy’s Dreamer and the scrunching harmonies of Chris Chambers’ beautiful arrangement of Boy Meets Girl’s Waiting for a Star to Fall are amongst these, not to mention the difficulties of being heard above the rumble of the Central Line. The season ends with a whole host of exciting small gigs icing our birthday cake as pride fever sweeps the nation. From moving performances at the Science Museum’s Sexuality Lates and eBay’s Pride Party, to a welcome home that passengers at Heathrow Airport will never forget and wonderfully colourful days singing and marching at Pride London and UK Pride on the Isle of Wight; we’ve been dosed up on rainbows, unicorns and glitter for the next few months at least. And so to the future; what do the next 35 years hold? My crystal ball has been a bit off of late, but I can definitely tell you to save the date for our first December concert in a decade! On Saturday, 15th December we take to the stage of the Cadogan Hall for a host of seasonal specialities and festive favourites as the Pinkies perform some of the classiest and campest Christmas number ones and songs from the most iconic Christmas movies (and yes, that might include Die Hard) as well as a few more traditional winter favourites. December 15th – Save The Date! 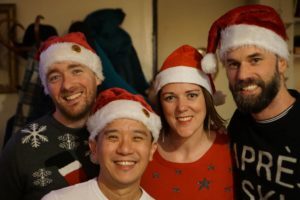 We’re looking forward to seeing you there in the hope that your days will be ‘merry and bright’ as we once again ‘make the Yuletide gay’. Next Next post: Sleighing It!